Robert Lewis Morrison was born on September 2, 1946 in Tyler, TX to Wilburn Franklin Morrison and Virginia Love Morrison. He passed away on February 5, 2019 in Lindale. Robert was a proud veteran of the Navy and served his country in Vietnam. He was a sports fan and loved to watch his teams but one of his favorite things to do was read and study his bible. 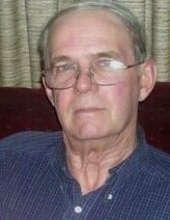 Mr. Morrison is survived by his daughter, Pama Hudson and husband David, grandchildren: Kynnedy and Ryley Hudson; brothers: Donny Morrison and wife Kathy, Steve Morrison and wife Debbie. He is preceded in death by his parents, wife, Linda Morrison, wife, Janet Morrison, sister, Beverley Morrison, and brother, Kenneth Morrison. A private family burial will be at Holly Springs Cemetery. "Email Address" would like to share the life celebration of Robert Lewis Morrison. Click on the "link" to go to share a favorite memory or leave a condolence message for the family.